Musings on math, education, teaching, and research. The following is part 1 of a recap of a talk I gave this past weekend at the CMC-South (California Math Council) conference in Palm Springs, CA. I attempted to make the case that educators and mathematicians should expand the definitions of proof in order to make this important aspect of mathematics accessible to elementary and middle school students, and more accessible to high school students. Currently, the class Geometry has a monopoly on proof in K-12 education. For the college football fans out there, Geometry is the Alabama of mathematical proof in school. Like Alabama, I hope that the stranglehold Geometry has on proof is on it's way out (take that, Crimson Tide). Geometry is too often the first time students are introduced to mathematical proof, and too often the last time students grapple with proof until well into college. I don't know how related this is, but the following graph represents a common refrain. "Oh, I hated math. I liked Geometry, but...ugh, everything else." 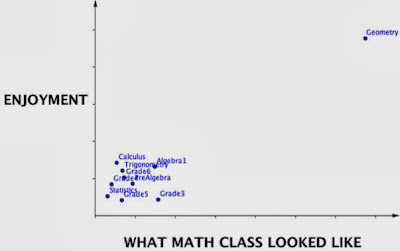 quantify "what math class looked like" or be angry with my lack of axis labeling. 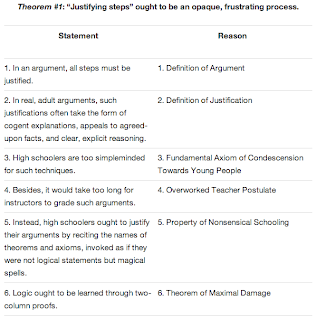 I do not see expanding the definition of proof as a hugely controversial proposal. After all, Merriam-Webster, a respected dictionary (at least it used to be), defines mathematical proof as "a test which shows that a calculation is correct." The Silver-Burdett Mathematical Dictionary I found on my classroom shelf doesn't even include a definition of proof. We can all agree that we can do better than that. The Online Free Dictionary's definition of mathematical proof represents what I see as the status quo: "a formal series of statements showing that if one thing is true something else necessarily follows from it." Starting with an agreed upon set of axioms (truths), proof is the process of showing that other things are also true. I don't want to change this; I simply want to relax our idea of "formality" to be more age-appropriate. Showing that something works for three examples will never be a proof. Saying "because it seems to be true" won't cut the mustard, hack it, or be up to snuff either. But what about the following argument related to a certain number trick? And my proof? 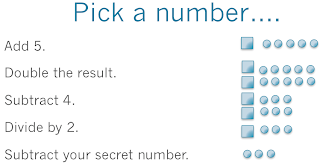 Let's say your secret number is box. And then I put my money where my mouth is. When a student claims to have a proof of an existing conjecture, they give their argument using whatever medium makes sense, ranging from a verbal argument to an interpretive dance. The rest of the class takes on the role of (respectful) skeptical peers. 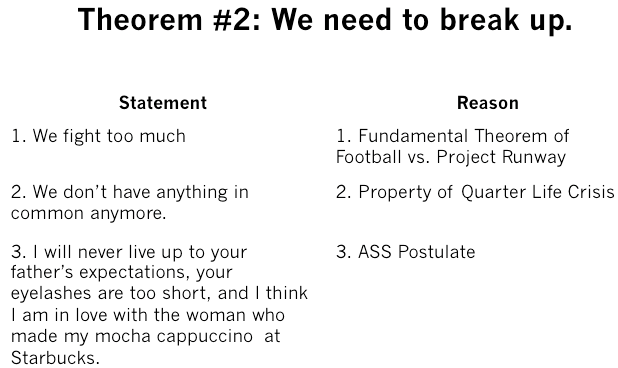 Once everyone is convinced, the class has a new theorem. Giving a cogent argument is hard work. Looking for flaws, counter-examples, and unclear logic is hard work. All of my students are working hard. The hardest part of this culture is not letting yourself, as the teacher, play the role of prophet. Students have to know that you'll let them create theorems that aren't true (at least for a bit). Otherwise, they have no incentive to play the role of skeptical peers. They'll just wait for your cue, whether it be "Sounds great! Anyone have any reasons to question that proof?" or "Hmmm...is that always going to be true?" Remember, we want the students to be analyzing the proof, not the teacher's response. I learned inductive proofs in Pre-calculus. Geometry was the class where I learned two-column and indirect proofs. I didn't know you could write proofs in paragraph form until I was in college and proofs without words didn't hit my radar until after I was teaching. There are a few problems with this, the first of which is that two-column proofs are a structure for proving, not a proof technique. The blog Math With bad Drawings has a cheeky, but poignant post titled "Two-column proofs that Two-column Proofs are Bad" that addresses many of the issues with this being the sole vehicle for proof in school. While the structure is intended to scaffold the idea of deductive proofs, it too often obfuscates the important idea of using a set of assumptions to show that something else must be true. Two-column proofs are also not a proof technique, but a way of organizing proofs. Imagine students going their whole life thinking that filling in data in a table was statistics. The other major issue with two-column proofs is that they are completely disconnected to how people make arguments in real life. I don't think the following has ever happened in the history of the world (but please let me know if I'm mistaken). I believe there are many proof techniques that students can begin to grapple with in elementary and middle school. Prove something using words. Draw pictures. Acquaint students with the ideas of indirect reasoning, induction, and parity. Introduce or create simple axiomatic systems and prove other truths using deductive reasoning. I'm telling you. These can all be done at a much earlier age than they are currently done. This is big, and a lot, and will be flushed out in part 3 of this tome post. I have a list of unanswered questions. You will most likely have more. What is the appropriate level of formality? I assume we can all agree that "I tested two examples" won't cut it as a proof at any age and that formal logic is overkill for students, there's a great expanse between these two extremes. How do you create a culture of skeptical peers in a classroom? How long, and to what extent, do you allow incorrect theorems to live? With an expanded definition of proof, what is the difference between an explanation/solution and a proof? Is this a skill/concept divide where work for demonstrating skills != proof while arguments for demonstrating concepts = proof? Or does this difference have more to do with the problem space? Or is a "proof" that 34*21=483 just too small of a problem space to call this a proof? We are typically ok with students saying "The sum of the interior angles of a triangle is 180 degrees." Should we instead be asking them to say "The sum of the interior angles of a triangle is 180 degrees within the problem space of Euclidean Geometry"? 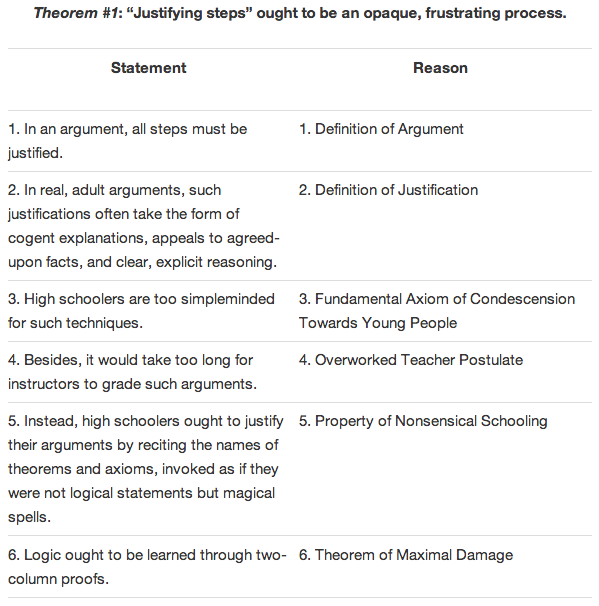 Even if we agree that it feels silly, is there harm in using the vocabulary of proof, theorem, etc. when talking about 78*53?4. 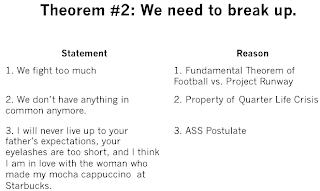 Is there harm in using the vocabulary of proof, theorem, etc. in a very small problem space (i.e. a particular game of Mastermind vs. Euclidean Geometry)? Some thoughts to ruminate and questions to ponder. In the end, I think this boils down to my belief that we will have a higher level of mathematical thinking and discourse if we allow ourselves a lower level of formality related to proof. Please feel free to disagree. You may submit your arguments (proofs?) in the comment section. I sometimes wonder about a good definition of proof being "answering the 'why?' questions until the questions become silly". Maybe that has to do with having been the parent of kids who are very good at the 'why?' game, though, and trying to prove to them that it is, in fact, bedtime. I think the "explain why" part of the role of proof is very well-served by the sort of less-formal modes of communication that you suggest here. The connections part sometimes requires more precise logic to make sure you're getting at the other ideas that are actually useful ingredients in understanding the idea in question. I wish I had been able to attend your session. This is very interesting and I am looking forward to reading the rest of your tome. @Josh: I agree with what you're saying about continuously answering the why question, and I guess I see a pedagogical, historical, and philosophical motivation for the rest of the class playing this role. Pedagogically, I see how this format increases the level of discourse, both from the perspective of the student sharing his or her proof and the rest of the students. Historically, there are a number of instances of proofs living in a state of limbo between conjecture and theorem while peers worked through these ideas with a fine tooth comb. The proof of Fermat's Last Theorem is probably the most famous example. And philosophically, I want my students to understand that mathematics is a human construct. We get to decide (as a community) what is true and what is not true. That said, we're pretty much on the same page about bridging proof with explanations. It's still an open questions, though, as to where this ends. As I said in the post, my explanation for a multiplication problem feels different-not like a proof. But maybe that's only because, for me, these are things that I deeply understand and "proved" long ago. Yeah, I agree that we're pretty much on the same page in terms of what to do, but maybe a little bit different in what parts of it we value most. I tend to use "convince a skeptical reader" more for the routine exercise-type work, as a guideline for how much justification they need to show and how thoroughly they need to explain their solution process. I use the "understand why" and "expose connections to other ideas" more when I want a proof-like answer to something that's usually a deeper problem. I think you're right about multiplication: if you're in 3rd or 4th grade, this kind of explanation would seem much more proof-like and deep and difficult. You're showing the connections between the distributive property, the place-value system, and the steps of the algorithm. Or something like that. Do you use Mastermind to teach proof in your geometry class? I would love to hear more about that. Just saw your newest post, can't wait to find a way to incorporate it into my classes. 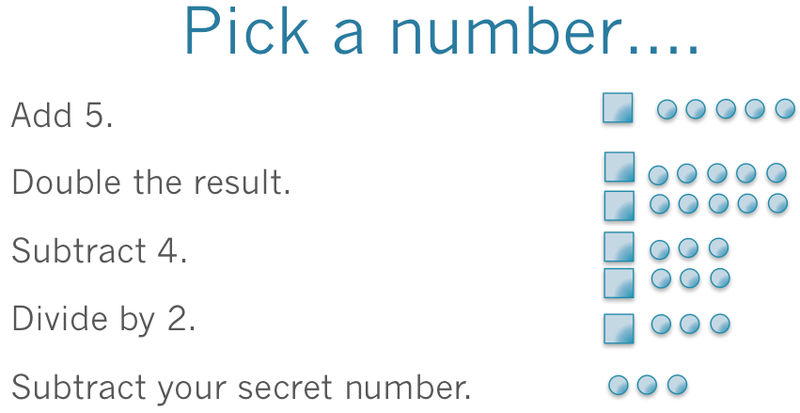 While researching Mastermind online, I found that it might have originated from a game called Bulls and Cows that uses the nine digits like you describe in your next post. I'm trying to come up with a catchier name. This is very interesting. I'm thinking lots about claims and justifying claims at the moment, and trying a few things out with my Year 4 class (Gr 3). I need to blog about this really, because there are lots of things to unpick. I agree with Joshua that understanding the "why" is the thing, having a sense of what is going on. But I also am beginning to think that the talk of moving statements from hunch to conjecture to proof (with all the other gradations in between) can work for young children; and also connects them with a whole history of mathematics. I've been teaching some permutation (or is that combination?) of math and science to third through twelfth graders in private and public schools for 15 years. This year I'll be working with 5th and 6th graders. I'm also pursuing my EdD in education. Click on the link above my blog posts for more information on that.